Backup to USB Drives with ViceVersa PRO Software. Fast. 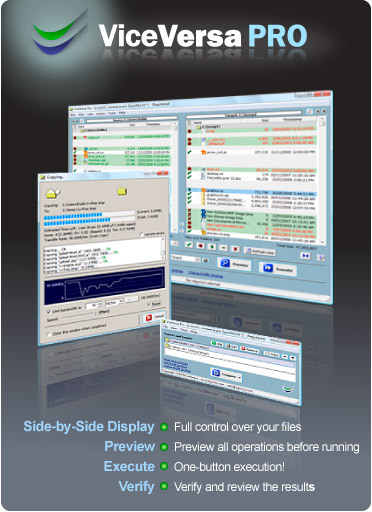 ViceVersa PRO: high-performance backup software utility for USB disk drives. Backup, replicate, copy files from PC, Laptop, Workstation, Server to USB drive. Real-time, scheduled, on-demand. You'll love it! With ViceVersa PRO you can make an exact backup copy of all your files / folders to USB drive. The first time it runs, ViceVersa PRO will copy all the files in the folders you selected to the USB drive (if the files are not already there). But after the initial run, ViceVersa PRO will automatically only copy files that are new or have changed since the last time, which is very fast: so you can have an always up-to-date, exact replica of all your important files on the USB drive, file by file and folder by folder. Fast. ViceVersa PRO software is optimized for speed. Backup files to USB drives.... fast ! Efficient. Files are firstly compared, then only new or changed files since the last backup are copied to the USB drive. No Proprietary Format. Files are copied to the USB drive in their original format. A 1:1 mirror. Automatic USB Backup. Schedule the backup to run automatically and unattended, at intervals or as soon as file changes are detected (real-time mode), at start-up or shut-down. Backup Open Files. So you do not have to stop working while the backup is running. Terabytes of Data. No limit on data size or file size. ViceVersa can handle terabytes of data and millions of files. Value for Money. Try ViceVersa PRO completely free for 30 days. Then it's only US$ 59.95 to purchase. System Requirements: Windows 10, 8.1 / 8, 7, Vista, XP. Windows Server 2016, 2012, 2008, 2003, 2000.